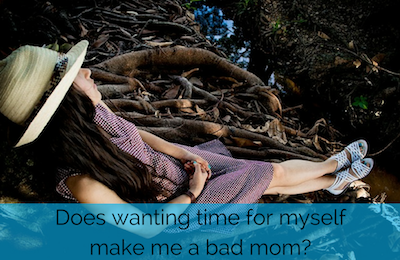 Does wanting time for myself make me a bad mom? I have an 8-year old daughter who loves talking. A LOT! When she’s petting the cat, she’s talking. Not only to the cat, but also to us. About how the cat is reacting to everything she does or about how he’s lying in her lap. Now I guess the people who’ve known me since I was a child will laugh when they read this. Because I was really talkative as well. And not only as a child! I remember my mom telling me about an uncle who took a longer road because I didn’t stop talking to him. So maybe I was as talkative as my daughter is now. And I still love talking. Sometimes. I like telling a story about how something happened. I use a lot of details and add things that later I wonder if it was really necessary for the story. But yes, I like talking as well. I did get calmer the last couple of years though and I don’t talk that much and that fast anymore. But I also like some quiet moments sometimes. Just read or do something for myself, without anyone talking to me. Silence. No music, no sounds other than what I'm used to hearing in my house. The buzzing of the fridge, the birds outside, a car that drives by. Nothing else. So today, when I was trying to read, and my daughter just couldn’t stop talking to me, well… I went upstairs. I needed a break. And I took it. Does that make me a bad mom? Sometimes I wonder about that. But no, I don’t think I’m a bad mom. I love my children very very much and I love spending time with them. And I listen to them. A lot! And I spend time with them. I give them attention. But to be able to do that, I also need my time alone sometimes. Sometimes I just need to recharge my batteries. You know what? I think doing that, taking some time for me when I really need it, doesn’t make me a bad mom. I think it makes me a better mom! Not better than other moms, no, better than if I would NOT take this time for myself. Doing that makes me feel better. So when I give my kids attention and I listen to them, I can REALLY be there for them. I don’t have to sacrifice myself for my kids, by spending ALL my time with them, if that doesn’t feel good for me. It wouldn’t be good for me, but it wouldn’t be good for them either. I’m not only a mom. I am many other things as well. I’m a woman who chooses to follow her intuition. A woman who follows her passion. A woman who needs some time off from everything every now and then. And that’s OK. It’s who I am. And I choose to honour that. And many other moments, I spend time with my kids. And I enjoy that very much!! And so do they! Do you find it hard to take time for yourself? Or are you afraid that you’re not a good mom if you do? Please believe me, you’re a better and nicer mom if you choose for yourself sometimes. Everything is easier when you’ve recharged your batteries! If you'd love to take some time for yourself you can listen to one of my free meditations, or you can choose to take a calm moment with your kids and listen to the kids meditation. They are all very short, so you don't need much time. However, they will help you (and your child) really relax. Click here to receive the free meditations.